Click here for the concealer swatches. Instead of Twist I wrote Peony.. Sorry for the mistake ladies! 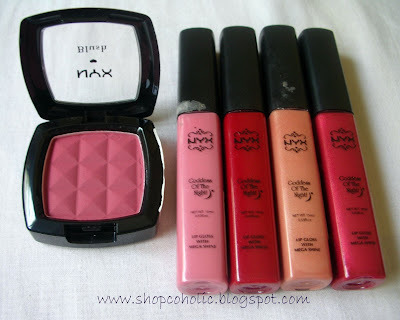 I really love NYX products! The Blush is super pigmented, I only need to tap my kabuki brush. Their Megashine gloss is non-sticky, pigmented and lasts for 4 hours while their lipstick is comparable to the high end ones. So glad I bought these products for less than 200 bucks each! 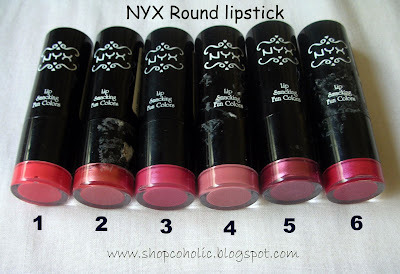 which nyx round lipstick u love? @ theBeautyjunkee - here lang po sa cebu. 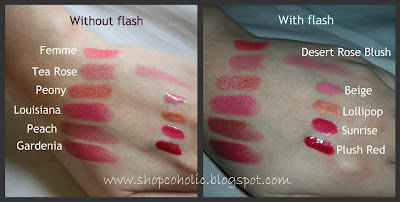 the lippies are only php 100 =) kasi limited colors lang. Mostly nudes and pinks..
wow nyx mania . great haul gawjuss!! same question where did you buy those? waahhh! i miss my tea rose!!! :( sniff!! i like how its pigmented..it seems like a lipstick already! Tea Rose looks very pretty. @ Louie - bought this sa White Gold in cebu. its just a small department store..
@ shen - hehe.. sayang its a nice color pa naman diba? @thiamere - yeah! nice noh? its more pigmented than MAC lipglass. staying power is almost the same too! Such a nice stuffies! Esp the lip products looks so amazing! i would really like to try some NYX too! My Beauty Tips & Tricks..